Jan just ended. Time flies. It's time to review my portfolio again. Nothing much happen on PJ Dev and Sunway in terms of price and corporate movement. Still pending on their next move. Chin Well - Acquisition almost completed, 2H will have the full contribution from its Vietnam plant. Price did not change much in Jan.
SCGM - New addition after ex-dividend. Bought it because of lower raw material price, good growth prospect, high profit margin, great cash flow and balance sheet and good ROE and ROIC. May evaluate again on next quarter report as my target price is around RM2.5. The current price is quite close to that. IFCAMSC-WA - New addition based on theme play. GST software revenue contribution may not be that high, will depend on its China business. Will evaluate again on next quarter release in Feb for its growth prospect. Will keep on monitoring this stock as the volume traded always quite high. And I already submit the form to convert it into mother share. ABRIC - Bought after ex-dividend but my buying price was little bit high. Bought because of its higher NA per share as well as cash per share. Let's see whether it can climb until RM0.53-RM0.55 or able to acquire a new business. 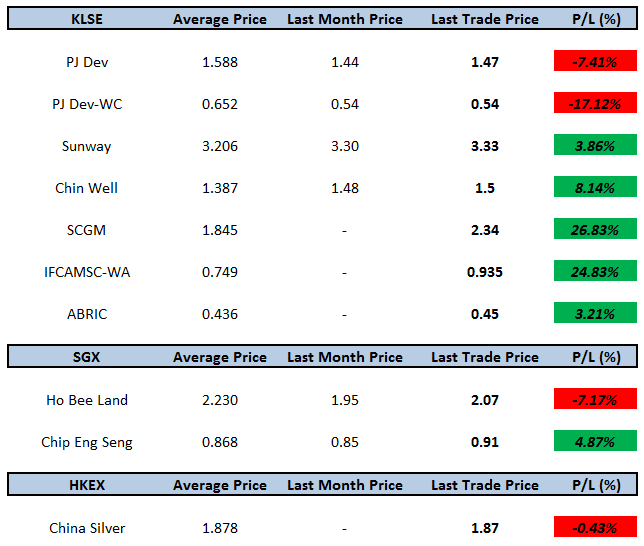 For Sg market, thanks to the renew interest in property stocks. HB Land and CES also move up a bit. Both counters also will release its quarter result in Feb.
For HK market, made my first purchase in HK market by taking very negligible ownership in China Silver Group. Bought it because of the group new business in online business on top of traditional silver smelting segment. Foresee net profit for the year 2014 will be double of the previous year. Looking back my trades on previous month, realized that I sold PohHuat too early. All furniture stocks rallied in Jan. In Jan, done studied OKA Corp, Century Logsitics (KLSE), AP Oil (SGX), China Silver, YuGang - Cross Harbour (HKEX) and also finish a book by William O'Neil. I also made adjustment to my fund allocation to diversify into HK market. 352 352 352 .. Sounds familiar? Yeah, that is the current formation Van Gaal likes to play. Hopefully, my portfolio performance will not be as poor as manu. Haha, can I play 10-0-0 (park-a-bus strategy)? Where will be your GK from? Diversified your portfolio to reduce the risk. So I show them a video of myself actually getting paid $500 for paid surveys to set the record straight.